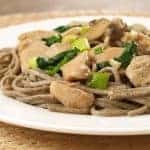 Generously flavored with garlic and ginger this recipe is a simple stir-fry of chicken, mushrooms and baby spinach tossed with Japanese soba noodles. 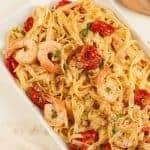 We like the nutty flavor and firm texture of these noodles in this dish, but you could just as easily substitute whole wheat or regular spaghetti. 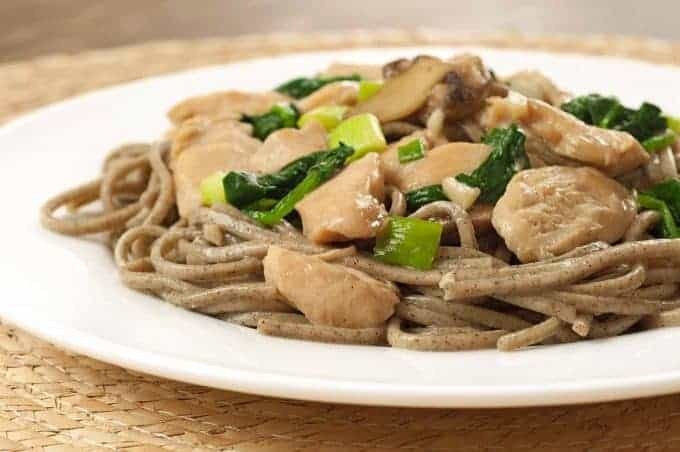 This is a quick, easy and economical stir-fry of chicken, mushrooms and spinach, flavored with ample amounts of garlic and ginger and served over Japanese buckwheat (soba) noodles. Bring a pot of salted water to a boil for the soba noodles. 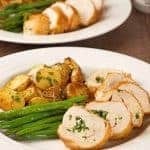 Using a sharp knife, trim away any white tendons from the chicken tenderloins and cut them into bite-sized pieces. Whisk the soy sauce, chicken broth and cornstarch together in a medium bowl until smooth. Add the chicken, garlic and ginger and combine thoroughly. Marinate at room temperature for 10 to 15 minutes. 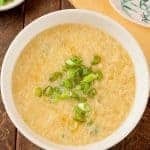 Prepare the sauce by whisking the chicken broth, soy sauce, rice wine and sugar together in a small bowl until the sugar dissolves. Set aside. Cook the soba noodles according to package directions, drain and set aside. Heat the vegetable and sesame oils in a wok or large skillet over high heat. Add the chicken and stir-fry until it’s no longer visibly pink, about 1-1/2 minutes. Quickly transfer to a plate, add the mushrooms to the pan and stir-fry until golden brown, 2 to 4 minutes. Add the chicken back to the pan and season with freshly ground black pepper. Stir in the reserved sauce and continue cooking until the chicken is cooked through and the sauce has thickened slightly, 1-1/2 to 2 minutes. Add the spinach and scallions and toss until the spinach has wilted. Add the soba noodles, toss to combine and serve immediately. 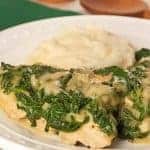 This recipe is both simple and versatile. 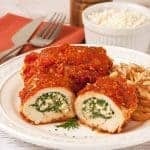 You can substitute pork, shrimp or tofu for the chicken, add thinly sliced red bell pepper or replace the spinach with snow or sugar snap peas. Japanese soba noodles are made with a combination of buckwheat and wheat flour and are rich in both protein and fiber. 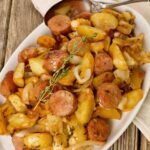 They have a subtle, nutty flavor and are often served in soups or cold with sauce for dipping, but they’re versatile enough to work well in stir-fries like this one. 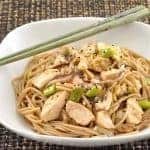 Just had minced pork with pasta in teriyaki sauce today, not very unlike this recipe, which shall be on my to prepare list real soon. Sounds absolutely delicious! Love all you flavors!